Fritz Lang’s 1924 film, Siegfried, the first half of his ambitious Die Nibelungen, used all kinds of romantic mechanisms to evoke perfection in its tragedy. Interestingly, this provocative use of sumptuous imagery and thematic melancholy was in turn used to create an expressionistic, self-aware effect in its catharsis. Siegfried had a number of factors synergizing to drive its romantic elements toward a fever pitch. It was produced (by either Decla Bioskop AG or UFA, (?)) at a time when spectacle trumped financial obstacles in German cinema. Despite the hyperinflation characteristic of the Weimar era, Lang was on a long leash for artistic license and expense. The film is also colored with romanticism from the political enthusiasms of screenwriter Thea von Harbou, whom most accounts agree was party to the ardent nationalism of the era. Lang’s own obsession with the anatomy of myth (he careful crafted the elaborate, often idealized myths surrounding his own life story) creates a generous background for a polysemous, modern, deconstructionist story. 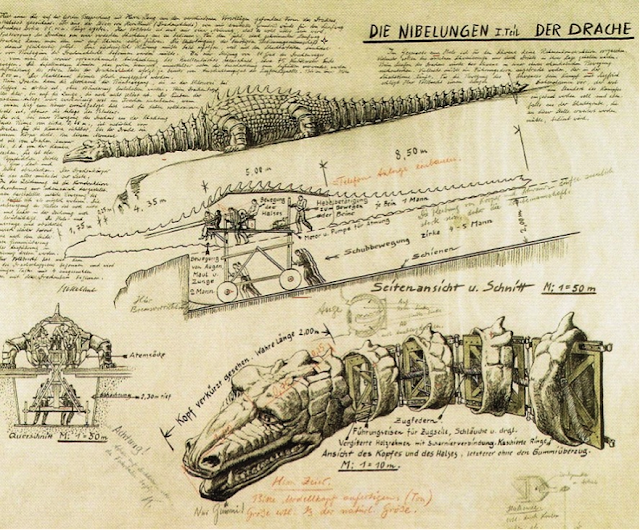 Die Nibelungen was based directly on the epic poem Nibelungenlied, which dates back to around 1200 A.D. (Though Wagner’s Der Ring Des Nibelungen (1876) was also based on this text, it appears that Lang and von Harbou both adamantly maintained that the films were minimally influenced by it.) 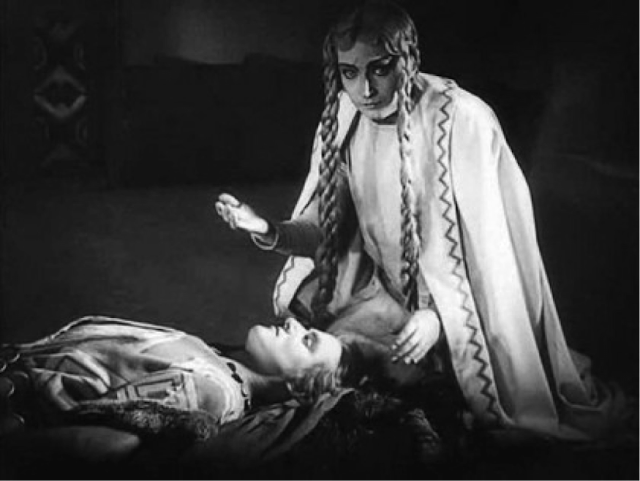 Interestingly, just as Shelley claimed that the “Epic Poets’ creations bore a defined and intelligible relation to the knowledge, sentiment, religion, and politics of their age,” The films of Die Nibelungen are also marked with the signs of the intense moment in history in which they were forged. The Weimar Republic claims a brief and often overlooked portion of European History. Formed in the aftermath of World War I, the new government was almost immediately disliked by many German citizens for accepting the terms of the Treaty of Versailles. These terms placed an implacable financial burden on the German people that ultimately lead to hyperinflation. Within a matter of months the exchange rate plummeted from 6.7 marks on the dollar at the end of 1919 to 800 marks on the dollar at the end of 1922, to over 4 billion marks on the dollar at the end of 1923. To say spirits were low is an understatement. Remarkably, many of the arts and sciences appear to have thrived in this kiln. Efforts to raise the spirits of the German public became an imperative, and films of an epic, heroic nature were far more popular with the public than the dark and formalistic forays of German Expressionism. With that in mind, Lang appears to have created a film that would appeal to and indulge the public demand for heroic mythos, but also to have severe and unmistakable modern elements, both in style and in narrative form. As Lang devoted his film “to the German people,” he created a hero that, while embodying classical ideals and romantic ideals of youth, vigor, and primitivism, also endowed him with Christian idealism and a distinct correlation with St George (the dragon slayer). Such a romantic hero, according to Shelley, would “inculcate virtue” as readers would admire and emulate his virtues. But Siegfried is also the least interesting character in the film. His innocence is repeatedly portrayed as naiveté and his mortal weakness is prominently exposited early in the film. If “poetry kindles the sympathetic imagination [and] allows us to find ourselves in another’s place,” then Lang appears not to have wanted his audience to identify too closely with this hero. Siegfried, caught up in feeling, threatens the primitive man describing Kriemhild, “Show me the way to Worms, or you will lose your life!” Such a volatile, compulsive behavior can only be moral within the lens of Romanticism. And Siegfried goes on to embody a Romantic ideal, beating foes by being impetuous and not particularly cunning. Ultimately Siegfried’s exploits are the preliminary upswing of a melancholy plot arc. From the moment Siegfried first arrives at Worms, the film firmly embraces an attraction to impossible situations. This pattern of attraction functions to create the suggestive undercurrent that Poe requires of poetry in The Philosophy of Composition. This undercurrent of trouble looming is tremendous at creating the tension that rendered tragedy the zeitgeist of Romantic form. 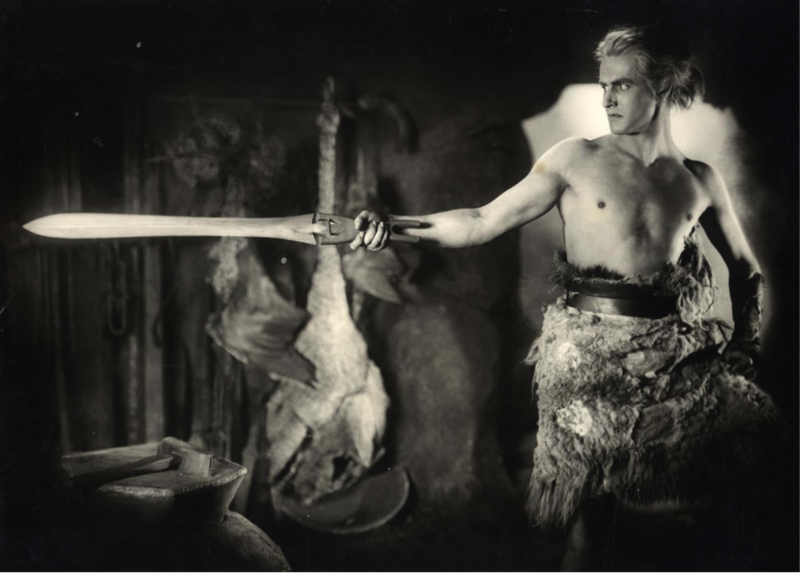 Lang’s Niebelungen films are formatted much like an epic poem, broken into episodes, and Siegfried’s character is even initially introduced to Kriemheld through a ballad. This parallel to poetic form shows Lang’s attentiveness to form, and the self-aware nature of the film itself, which picks up complexity as the moral order of the remaining characters hits the fan. Lang’s artistic decisions in this film seem bent on dwelling on aesthetic detail, special effects, and elaborate sets. That he managed to indulge in such aesthetics, at a time of such economic turmoil, is telling. The novelty of special effects in film fantasy opened up access to resources at an otherwise dire time. 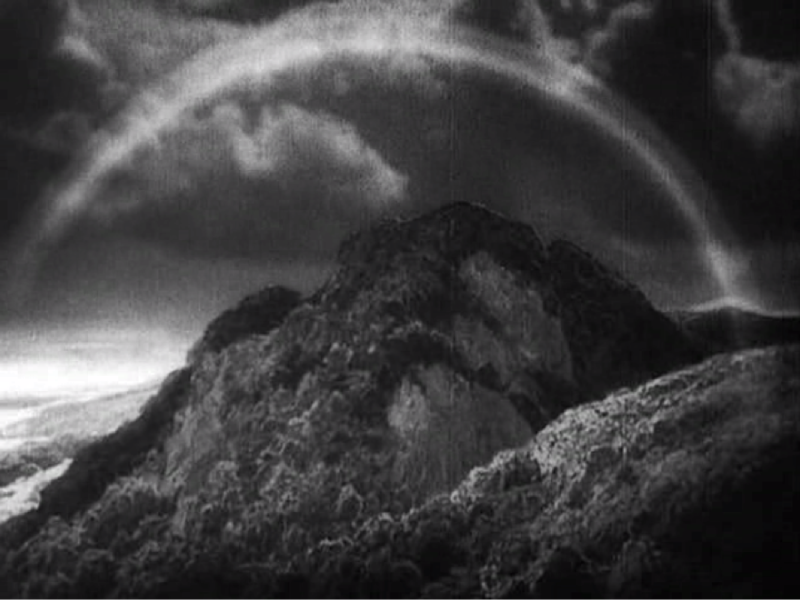 That Lang managed to create an actual manmade rainbow to film, or to design and have built a 60 foot long wooden dragon-puppet, at a time when workers and extras had to literally be paid with wheelbarrows full of cash is remarkable. It indicates that not only were these sensory details important to Lang, and important to the tone and form of the film, they were important to the contemporary audience as well. The impressive images of Worms, with its elevated battlements and atmosphere of power seems like a “bastion of all humans can achieve.”1 Such motifs not only look impressive, but also create tremendous meaning regarding the systems in which this narrative is progressing. Systems of power, tradition, moral codes, and of the valuation of beauty. The deconstruction of this system and its moral code becomes a prominent theme in Kriemhild’s Revenge, but it is also present in Gunther’s perpetual state of dilemma. The loss of Siegfried acts as a cataclysmic loss of youth, beauty, and innocence. The entire possibility of moral order disintegrates with his death. At this point, the melancholy of the film quickly passes by the tragic ideal of Romanticism and takes on a much darker, more complex and calculated edge. Rather than dwelling on the poetic image of Kriemhild mourning her lover, we quickly pass over into the realm of vengeance and loyalties. Ultimately, Lang’s project carries far more semiotic weight than being an exploration of Romantic ideals. But he used that exploration and those ideals to create a narrative that explores a number of the difficulties and nuances of moral and economic order that were terribly relevant to Lang and to “The People of Germany,” to whom he devoted the film.